In the mid 80s Unesco collaborated with some African countries in field projects related to cultural heritage. To that effect two major projects on museums were carried out: a national project in Zaire through the National Institute of Museums of Zaire, and a regional training program for museologists based in Niamey, Niger. With a view to evaluate the achievements and results of these projects it was decided by Unesco and UNDP to undertake field evaluation missions in the late 80s. The Unesco/UNDP Regional Coordinator in Latin America and the Caribbean S. Mutal was given the assignment as head of mission along with the Unesco representative in the person of Omar Alpha Konare from Mali, president of ICOM and Minister of Culture of Mali. Mr. Konare has since then been president of Mali for two terms. 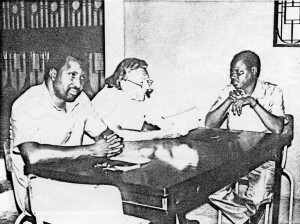 The findings, conclusions and recommendations of these missions to Zaire and Niger (illustrated) are to be found in reports B.1 and B.2 written by Konare and Mutal. 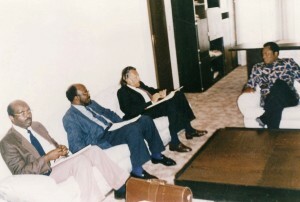 In 1988 an evaluation mission was fielded to Gabon, Angola, Congo and some neighboring countries to evaluate the doings and results of a regional project which set up the Center of Bantu Civilizations (CICIBA) in Libreville. S. Mutal was asked by UNDP to head this mission along with the Unesco consultants Martin Alihanga and Elikia M’Bloko from Congo. All documents have been written in French and submitted to the heritage community, the governments concerned, and Unesco/ UNDP in the field and respective headquarters. B.2 Niamey, Niger. Projet Régional. Formation des Muséologues dans les Pays Africains. Evaluation Externe.